Two A-level students could win the trip of a lifetime, joining NASA to look for life at the edge of space. As part of their education programme, NESTA is offering two A-level students the opportunity to take part in a research trip to NASA and the Black Rock Desert in Nevada, USA. They will be joining three NESTA scientists who been working to discover what kinds of life exist at the extreme edge of the atmosphere. Together with a NASA astrobiology team, they will launch a robot 40 kilometres into the stratosphere on a powerful rocket. Details of the competition challenge and how to enter can be found on the NESTA website. But note that the deadline is tight, due to the amount of time it takes to get security clearance to enter the NASA base the entries need to be back by 24 May 2010. But take this as a good sign — a tight deadline may mean fewer applications and you might have a greater chance of success than you think! So good luck, and see you in the stratosphere! Did aliens help prehistoric Britons found the ancient Woolworths civilisation? And what does tying your shoe laces have to do with DNA? Find out with this year's popular lectures organised by the London Mathematical Society. Matt Parker of Queen Mary, University of London, will explore how seemingly incredible results can actually be meaningless random patterns, and Dorothy Buck of Imperial College, London, will look at how mathematical knot theory helps to understand DNA. Tickets are free but please book a ticket by the 25th of June and 24th of September respectively from Lee-Anne Parker, London Mathematical Society, De Morgan House, 57-58 Russell Square, London, WC1B 4HS (email: leeanne.parker@lms.ac.uk). Who is your favourite fictional mathematician? Due to popular demand, we're revisiting our poll to find your favourite fictional mathematician. It is quite difficult to compile a list of fictional mathematicians. Scientists are often portrayed in films — usually as mad — but there are very few who are specialised mathematicians. Here at Plus, we have come up with a list that we think covers most well-known fictional mathematicians, although it is debatable whether some are even mathematicians at all! We are asking for your opinion — who is your favourite? Have we missed yours off the list? Please leave a comment and let us know. We will write a biography of the character who wins the poll. The Abel Prize 2010 has been awarded to John T. Tate from the University of Texas at Austin "for his vast and lasting impact on the theory of numbers". The honour puts Tate on a par with a Nobel Prize winner. In fact, the Abel Prize was established to make up for the fact that there is no Nobel Prize in mathematics. 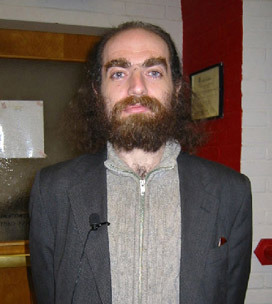 Last week the Clay Mathematics Institute announced that Grigoriy Perelman has won the Millennium Prize for his proof of the century old Poincaré Conjecture. And almost as soon as it was announced the speculation began as to whether Perelman would accept the prize, and the $US 1,000,000 of prize money. The Poincaré Conjecture is a question essentially about the nature of shapes in space. Mathematicians have long understood the nature of every possible 2D surface in 3D space. For example the surface of a sphere, such as the outside of a ball, is completely characterised by being simply connected — it has no edge, and any loop on the surface can be slid off without being cut or torn. And these two properties are true not matter how much a sphere is squashed or stretched out of shape. 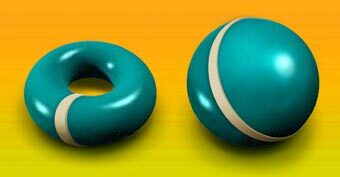 However they aren't true for any other kind of 2D surface, for example the surface of a doughnut: a loop through the centre hole of a donut can't be removed without being cut. That is because a doughnut is not the same, topologically speaking, as a sphere. Poincaré proposed that all 3D spheres can be characterised by the same two properties. However for over a century the result remained unproven despite the efforts of some of the best mathematical minds. The problem was seen as so important that it was included in the list of seven Millennium Problems chosen by the Clay Institute in 2000. The solution to any of these Millennium Problems would be a monumental advancement in mathematics, and the Clay Institute offered a prize of $US 1,000,000 for the solution for each. In 2003 Perelman surpised the mathematical world by posting a proof of a much wider conjecture online. He claimed to have proved Thurston's Geometrisation Conjecture, that characterised every 3D surface. The Poincaré Conjecture would be proven true as a consequence of this wider result. After much examination, discussion and exposition, the mathematical community accepted that Perelman had proved the Poincaré conjecture and he was awarded the Fields Medal in 2006, the highest prize in mathematics. Controversially Perelman declined to accept the prize, the first person to ever do so. He withdrew from mathematics and now lives a reclusive life in the outskirts of St Petersburg. Now that Perelman's work has survived several years of critical review and has been accepted by the mathematical world the Clay Institute has awarded him the Millennium Prize for his proof of the Poincaré Conjecture, the first of the Millennium Problems to be solved. However most people in the mathematical community expect that, like the Fields medal, Perelman will not accept this prize or the prize money. Despite some reports in the media, the Clay Institute told Plus that they had been in contact with Perelman and that "he said he would think about it". "I think there is something noble in that he values solving a mathematical problem above the glory of being in the limelight and winning prizes and getting vast sums of money. There is something rather nice about Perelman's choice to just enjoy the mathematics." You can read more about the Poincaré Conjecture and the Clay Millennium Problems on Plus, and you can read more about his award, including his original papers at the Clay Mathematics Institute. The worrying decline of Arctic sea ice as a result of global warming is continuing. Last month the results of the Catlin Arctic Survey, an expedition to measure the thickness of Arctic sea ice, were presented at a press conference called by the World Wildlife Fund. On their 434km trek across the Arctic the explorers measured an average ice thickness of 1.77m. This confirms that the ice is getting thinner, but also means that they encountered mainly young ice, rather than the older and thicker multi-year ice they had expected. "There now is no doubt in the scientific community that the Arctic ice cap is melting, and that this is due to man-made global warming. "This is nonsense.Man-made global warming is a theory which is increasingly at variance with the facts;there has been no statistically significant global warming for at least a decade. There is no consensus and just repeating a statement does not make it true. "The Arctic Ocean covers 5,427,000 square miles. Catlin 2010 has seen maybe ten square miles of it, meaning they have sampled less than 0.0002% of the ice. They also choose to travel on refrozen leads because they are flatter and smoother, so their sampling is not random. No serious scientist would attempt to draw any conclusions about the quality of the ice based on a cherry picked sample representing less than 0.0002% of the Arctic" Taken from Watts up With That to provide some balance.